One of the first modifications I made after purchasing my 1997 Montero Sport was to replace the air filter with the K&N factory air filter replacement element. This was a temporary solution - a reusable element without making modifications that would affect warrenty service. The K&N is a great choice if you want a reusable filter and wish to retain the stock air box, but don't expect any phenomenal performance gains. The stock air filter isn't hugely restrictive. If you're not going to get a performance increase from the new filter without removing the air box, then what's the point of keeping the stock box and filter assembly? Depending on where you live and how you use your vehicle there may be two very good reasons. The two reasons are water and dust. The K&N filter element is made of an oiled cotton gauze and the oil is water soluble so you can't submerge it or continually splash it with water. Open element filters in engine bays are easily splashed or completely submerged in water crossings. Splashing the filter with enough water will wash the oil out of the cotton gauze and the filter will stop filtering. 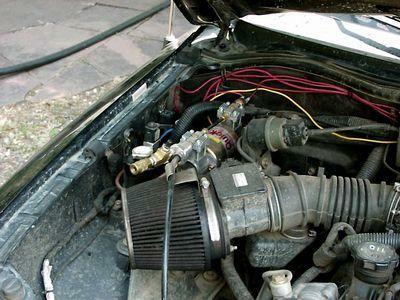 An exposed - open element - filter also drastically increases the risk of sucking water into the engine. The risk of hydro-locking is very real and the result is not anything you want to experience. K&N originally designed their filters for racing applications so the trade off is filtering ability versus decreased air flow restriction. In extremely dust prone areas with very, very fine dust it will let more particles into the engine than most stock air filters. Most air boxes are designed to protect the filter from random water splashes. Some boxes (like the box in the Montero and Montero Sport) are designed to go the extra mile and protect against anything but complete submersion. Then there are the very few that attempt to do a kind of 'pre-filtering' by knocking dust particles out of suspension in the air stream before they reach the air filter. If you are in a very wet environment and/or have to deal with frequent water crossings or an extremely dusty environment with very fine dust, an open element K&N filter solution is probably not for you. I'm going to assume the reader (that's you) has done some surfing on K&N filters and if so has probably run across a few forum posts, articles and blogs about how the K&N filter is a total piece of junk and lets dust particles the size of double wide mobile homes through, caused my nitrous injected toaster-oven to spontaneously explode and made my wife run off with my dog, etc. To date, I have NEVER, EVER, EVER in 30+ years talked to or found anyone that could definitively prove that running a K&N air filter was directly responsible for the decreased lifespan or catastrophic destruction of their engine - WHEN - and this is the key word, !!!WHEN!!! they serviced, maintained and used them CORRECTLY. In my experience, failure to service and correctly maintain causes the most problems with correct use coming in second. The number one, top of the list, primary, FIRST AND FORMOST reason for poor filtration IS BECAUSE THE FILTER WAS NOT OILED CORRECTLY and 'correctly' usually means not enough oil was applied. Correctly oiling a K&N filter is critical; if enough oil isn't applied to the gauze the filter won't catch and retain the particles. BTW, in my humble opinion the filters are not adequately oiled from K&N. I ALWAYS give a new filter a light spritz before I install it for the fist time. Number two, the filter was installed and hasn't been re-oiled since and it's been three years. K&N filters are not 'install and forget'. If its not being removed and cleaned on a frequent basis (every six to eight months or so), periodically it needs to be lightly spritzed with filter oil. If the gauze is still visible and is no longer light red (fading more to dirty white) then it's time for a spirtz. Number three is ignoring K&N's instructions. Such as, don't use forced air, don't use a brush, don't stick it in the oven to dry, don't use chemicals like carburetor cleaner, ONLY use K&N oil and cleaner, etc. Improper use almost always involves water. K&N filter oil is water soluble so if it gets wet it'll wash out and once the oil is gone - well, no more filtering. Use common sense and read the instructions if you're going to use an open element K&N gauze type filter. If you're really concerned about dust getting through the filter and random splashes use a K&N Drycharger wrap for extra protection. The FIPK kit isn't specifically made for the Montero Sport and as such it isn't a total bolt-in solution. The kit is actually advertised on K&N's site as being for the Mitsubishi GT3000 and Dodge Stealth. The part number for the K&N FIPK kit is 57-1500-1. It comes with an air filter, a couple brackets, the air filter adapter plate that attaches to the MAF and assorted nuts and bolts. Originally mine came with a small bottle of filter oil and a small bottle of cleaner but that doesn't appear to be the case anymore. Depending on where you shop these kits run from $140 to $200 US. The Drycharger wrap part number is RF-1001D followed by the color letter (K=black, L=blue, R=red, Y=yellow) and typically costs between $25 and $40 US. The replacement air filter part number is RF-1001. Step 1The first thing that needs to be done is to unplug the MAF harness and remove the original air box assembly, MAF and intake hose to the throttle body from the vehicle. You will then need to separate the MAF, air box and hose assembly. This can be done with basic hand tools and only takes a few minutes. Two things to note at this point. First, be VERY careful with the MAF! Do not drop it or bang it around and keep your greasy, dirty fingers out of the inside. This is a sensitive electronic device and they're very expensive to replace. Second, now is a convenient time to clean the MAF. Use MAS/MAF cleaner purchasable at any automotive supply store. DO NOT use any other chemicals, rags, brushes, etc. on the inside and do not use compressed air to dry the MAF. Spritz it down good and let it air dry. Step 2When the MAF is dry attach the filter adapter supplied by K&N to the MAF with the four supplied nuts and bolts. Do not over tighten and tighten the four bolts down to the same point as evenly as possible. Attach the air hose to the MAF assembly, then re-attach the filter adapter/MAF/hose assembly to the throttle body in the vehicle. Tighten the hose clamp at the throttle body enough so the hose stays steady. Step 3At this point you need to either fabricate a new bracket to mount the MAF and filter assembly to the fender skirt or you need to modify the supplied bracket(s). I chose to modify one of the original braces by straightening and then re-bending the brace until I could mount one end to the MAF and the other end to a one of the threaded mount holes formerly used by the air box assembly. This isn't the perfect solution. You SHOULD have two braces to hold the assembly but one will do in a pinch. Once you have your brace made you can mount it to the fender skirt and the MAF assembly. It was easier for me to remove the MAF/hose assembly, install the brace and then reinstall the MAF/hose assembly. YMMV. Position the assembly and snug down the throttle body hose clamp and the filter assembly brace bolts. Test fit the filter making sure the filter clears the the inner fender, headlight and hood. Make sure nothing can brush against the filter. Once you're happy with the positioning tighten everything down and reconnect the MAF harness. If you purchased the Drycharger wrap now is the time to install it. Step 4Start the vehicle and double check the installation making sure you didn't miss anything and everything still has adequate clearance. The FIPK kit does provide a less restricted air flow path than the stock filter and air box assembly and if you choose to clean the MAF and if it was significantly dirty you may notice the engine idle is a little uneven. This is normal since the vehicle's ECU (computer) requires time to readjust to changes in flow and signal. If you have the capability I recommend resetting the ECU. This will speed the 'learning' process up somewhat. If not, the ECU will readjust within a few days depending on the amount of driving you do. Overall, this is a relatively quick and inexpensive modification and it is worth a small increase in gas millage as well as low end torque. I think it is well worth the effort especially if combined with the exhaust modifications. An additional modification that one may want to consider as a future project is a heat shield and a way to duct cold air from outside to the air filter assembly. It doesn't have to be frilly, just a way to get cooler air around the filter so the engine isn't sucking in blistering hot air radiating off the engine.